Grab your beach bag and head off to discover the beaches and clear mediterranean waters of the Costa Tropical de Granada. 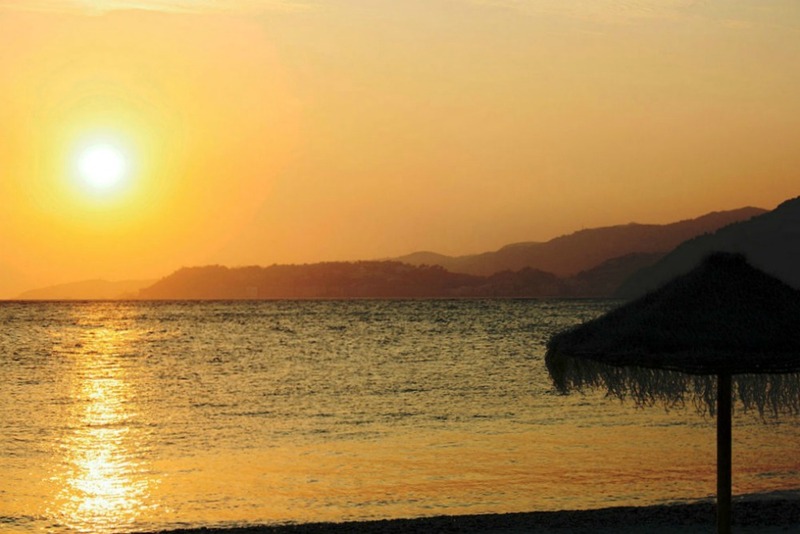 Situated between the Costa Almería and the better known Costa del Sol, this beautiful stretch of coastline boasts many great beaches ideal for swimming and water sports, including a few with ‘Blue Flag’* status near Motril. Click on the +/- toggle buttons in the sections below to view the details of individual beaches or skip straight to our GranadaSpain Beach Location Mapat the bottom of the page. And look out for the Blue Flag* symbol and the ***** GranadaSpain stamp of approval which indicates our favourite beaches. 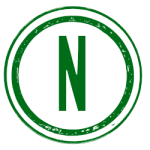 The green N signifies the nudist beaches – always good to know, whatever it is that you are looking for. Named for its sub-tropical climate, a result of its unique position south of the Sierra Nevada mountains and so close to Africa across the Med, the nearest beaches of the Costa Tropical are only an hour from the city. The beach lovers among you can look forward to remote and secluded coves overlooked by dramatic cliffs as well as the the more open ‘popular’ beaches with all the chiringuitos** and other amenities that you would expect of the larger resorts. Organised into four main areas are highlighted just some of the beaches from La Rábita in the east to Cantarrijan in the west. Click on the red links to skip to each section. Located at the most eastern end of the Costa Tropical this urban beach is well maintained and quite popular with the Spanish in high season. Sand grade: Crushed stone and pebble mix. Beach: 700m long and avg 30m wide. Swimming/activities: Calm clear waters make it family friendly. Yatch hire. Amenities: A few chirringuitos open in summer months. Litter bins. Toilets. Disabled access. Getting there: Take the A7 in the direction of Almeria and take the sign for La Rábita. Where to stay: Right on the beach is Hotel Las Conchas Clean and friendly, rooms light and airy. Great beach views. 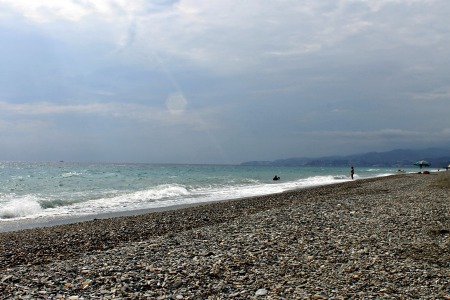 Playa el Ruso is a secluded nudist beach situated 1.5 km west of La Rábita. As you might expect the remoteness means that you won’t find any chiringuitos on this beach. Sand grade: Dark volcanic sand. Beach: 300m long and approx 25m wide. Swimming/activities: Deep clear waters. Calm. Nudist. Getting there: It is a little tricky but the beach can be accessed on foot from the N-340. Castell de Ferro is a small fishing village with a well maintained urban beach with boardwalk that is popular in high season. Swimming/activities: Moderate waves. Water sports including sailing and scuba diving. Getting there: Take the A-44 towards Almería, then follow the N-323 and the N-340 directly to the village. Where to stay: La Ventera is a guesthouse located 12km inland in the quiet village of Gualchos. Where to eat: Restaurant la Brisa, Plaza de España. For those who prefer something a little more secluded check out nearby pretty Cala de la Rijana. This is a very popular spot with scuba-divers. Getting there: Take the A-44 towards Almería, then follow the N-323 and the N-340 directly to the village. From there access is on foot from the N340 only. There is a good choice for beach lovers around Motril including three with Blue Flags, assuring clean beaches and great water quality. Very popular family friendly urban beach with boardwalk, restaurants and playground. 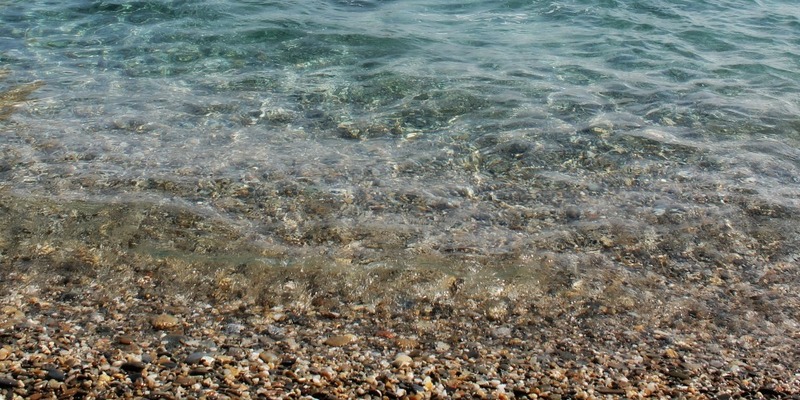 A GranadaSpain favourite for its clear water, its general kid-friendliness and the seafood! Where to stay: Hotel Embarcadero is clean, comfortable and right on the beach. Where to eat: Also right on the beach is a great little chiringuito called El Chambao de Paco where you can have a nice cold beer and tapas or a good seafood lunch. Traveling west just around the headland from Calahonda is Carchuna, a large semi-urban beach which is a popular spot for kite surfers. Amenities: Litter bins. Disabled access. Popular Torre Nueva offers a long, wide urban beach with several bars and restaurants to choose from. 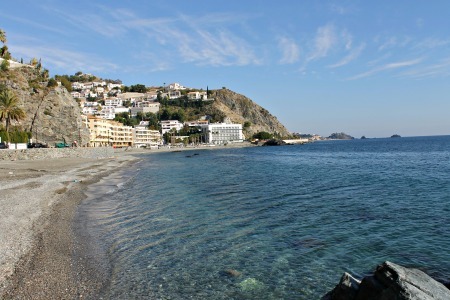 This is one of Motril’s best known and popular seaside spots. It is a well-maintained urban beach with a long gravel promenade, bars, shops and restaurants. Swimming/activities: Moderate swell. 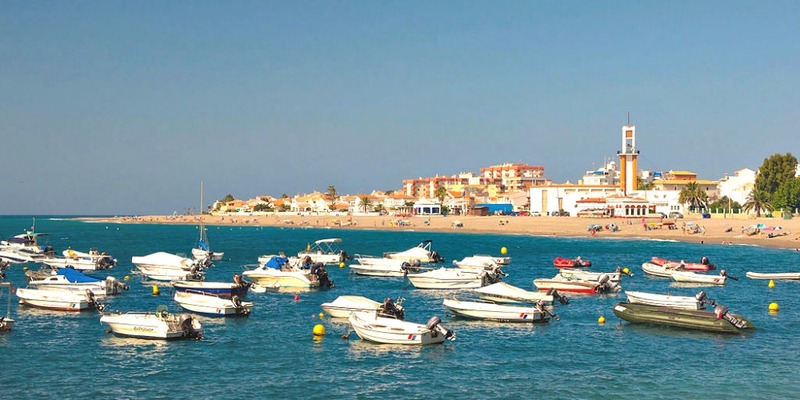 Club Nautico de Motril is located nearby in Puerto de Motril where you can rent yachts and arrange sailing courses. Amenities: Toilets. Litter bins. Umbrella and sunbed rental. Disabled access. 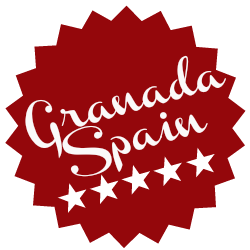 Situated next to the Costa Tropical’s only golf course, Los Moriscos, Playa de Granada is a long narrow semi-urban beach which has retained its Blue Flag status for 2014/15. It is relatively quiet and has lots of free parking and is very quick to access from the main road which make is a GranadaSpain favourite. Check out the Los Moriscos bar for ice creams and fresh juices. Amenities: Toilets. Showers. Sunbed and umbrellas for hire. Good access onto the beach for those with disabilities. Where to stay: Robinson Club Playa Granada is a 4 star beach resort, part of a German chain, is next to the 18-hole Los Moriscos golf course. Elba Motril Beach & Business hotel is also close to the beach, or, if you prefer something with a bit more character there is Motril’s Casa de Los Bates a 19th century Italian-style country mansion set in beautiful gardens. There are also apartments for rent. This secluded, little-known nudist beach, not far from Torre Nueva is usually very quiet due to tricky access down a 500-metre stairway. Getting there: Park up on N-340 coastal road and access on foot. If you are coming from the city, or the ski slopes, Salobreña beaches are the closest and so a good choice if you are on a day trip. You can actually see the snow-capped mountains of the Sierra Nevada from Playa del Pennon. Here is a brilliant post on how to get from piste to playa in one day from one of our contributors, Josh Taylor. Known to some as Playa de la Peñon this is the larger of the two main beaches at Salobreña. This wide and open beach can feel a bit windy and exposed; great for a blowy walk on a sunny day off-season. Numerous typically Spanish chiringuitos serve the sea front but you will also find places serving egg and chips if that is what you are looking for. Amenities: Litter bins. Toilets and showers. Sunbeds and umbrellas for hire. Getting there: Turn off the N-340 and follow signs for Playa. Easy on-street parking. 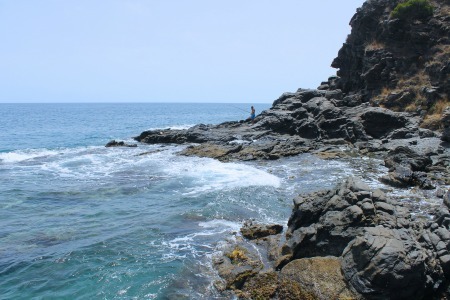 Separated from La Charca by El Peñon, a rocky promontory, is the somewhat wilder Playa de la Guardia. Amenities: Litter bins. Sunbed and umbrella rental. As you continue west along the high coastal road from Salobreña towards Almuñécar you get fantastic views of the sea and the coastline ahead. There are some fabulous beaches to choose from in this area. This picturesque little cove can be accessed by car off season, but be warned, the track is rough and narrow. If you don’t mind a bit of a walk it is well worth it to enjoy calm clear waters great for swimming. If you have water shoes, do take them as getting into the water is a little rocky. There is a chiringuito open by the beach in the summer but you should probably take your own snacks and drinks out of season. Getting there: Turn off the N-340 for Urbanización Alfa Mar, park-up and walk down the track to the beach. 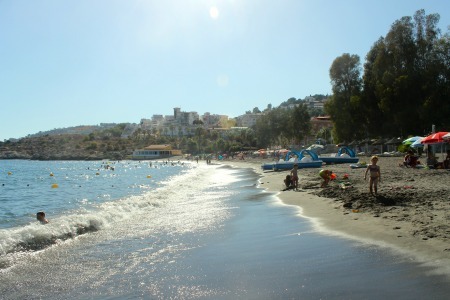 La Cabria is a wonderful little beach with restaurants and sunbeds and umbrellas to hire. 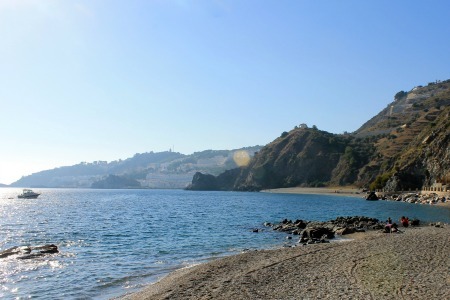 From here you can access Curumbico beach, the neighbouring cove, by sea or by a path through the rocks. The sand here is finer than the pebbly surface of La Cabria. This is the #1 beach of choice for GranadaSpain due to the easy parking, and the great seafood at Tito Yayo right on the beach. Be sure to reserve a table as soon you arrive at the beach as it fills up very quickly come the lunching hour. Swimming/activities: Waves are moderate to calm. Amenities: Litter bins. Shower. Access to toilets in restaurants. Getting there: From the N-340/A7 driving west, take the 4th exit on the Almuñécar/Málaga roundabout. The beach is signposted and you have to follow an unmade track. There is parking just below the Hotel Playa Calida. If you keep going you can also park right by the beach. Easy access, fine sand and shallow waters make this a great child friendly beach. Amenities: Litter bins and cleaning services. Toilets and showers??? 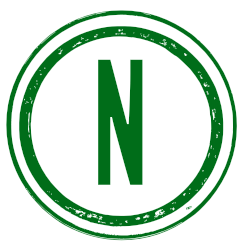 Getting there: Turn off the N-340. This is another great family beach with a beach restaurants, amenities, fine sand and safe shallow waters. It does, however, get very busy is high season due to its proximity to Hotel Bahía Tropical. This is a favourite GranadaSpain beach because you won’t find a better burger or cheese cake on the Costa than the ones supplied at beach-side Iguana Playa Restaurante. If you love seafood you could have a more traditional Spanish lunch at Restaurante Viña del Mar. Amenities: Litter bins and cleaning. Sunbeds and umbrellas for rental. Pedalos, canoes and sail boats for hire. Getting there: Turn of the N-340. Arrive early to find parking in high season. El Tesorillo, named after the discovery once upon a time of treasure on this beach, is another fine example of Almuñécar’s beautiful beaches. It is made memorable by the presence of an ancient Moorish watchtower also visible from neighbouring Pozuelo. Another good family beach with two Italian and Spanish restaurants to choose from. Beach: 80m long and approximately 55m wide. Amenities: Litter bins. Sunbed and umbrella rental. Sail boat hire. Getting there: Turn off N-340 coastal road. 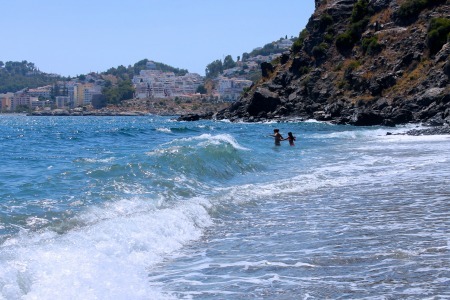 One of the main Almuñécar beaches Velilla is also the largest and nearly 1.5km in length. There are numerous chiringuitos, restaurants, ice cream bars etc. It gets very busy in high season so get there early to find parking and your beach spot and indulge in a second breakfast of churros* and coffee on the beach. Amenities: Litter bins. Sunbed and umbrella rental. Sail boats for hire. Aqua Tropic water park. Getting there: Turn off the N-340. On-street and underground parking available although it may take time to find a place in the summer. A typical urban beach and easily the most popular in Almuñécar, Puerta del Mar is right in the town centre and gives easy access to to the shops, banks and eating and drinking holes. Lots of fun to be had day and night. Sand grade: Gravel and dark sand. Beach: 1140m long and 50m wide. Amenities: Litter bins. Toilets and showers. Sunbeds and umbrellas to rent. Boat hire. Getting there: Follow signs from the N-340. Street parking and underground parking. San Cristobal is another lively and popular beach. The western end is known as La China and boasts a number of restaurants, bars, guest house and hotels. Swimming/activities: Calm waters. Popular with joggers. Amenities: Litter bins. Toilets and showers. Sunbed and umbrella hire. Boat hire. blog for more on what make this one of our favourite beaches. Swimming/activities: Calm waters and anchoring area. Amenities: Litter bins. Toilets and showers. Getting there: Take the sign post for Cotobro from the N-340 coastal road or drive along the Almuñécar Paseo Maritimo. Despite the name Beach of the Dead El Muerto is a popular cove that attracts nudists and non-nudists alike in high season. You can get there on foot by the headland footway from Cotobro beach. Beach: 228m long and 42m wide. Amenities: Bins and cleaning services. Located in Port Marina del Este, Los Berengueles is an attractive semi-urban beach that offers a good choice of bars and restaurants. Swimming/activities: Calm waters popular for snorkeling and and scuba-diving. Amenities: Litter bins. Sunbed and umbrella rental. Boat hire. Getting there: Turn off N-340 coastal road. 1km from Marina del Este. 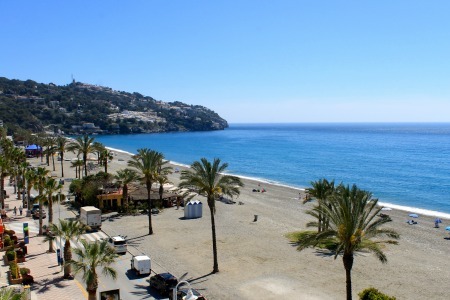 Sheltered La Herradura bay, so named after its horseshoe shape, is the place to go for water sports and also boasts and variety of restaurants along the seafront. It is very popular with the locals. Swimming/activities: Calm and sheltered waters. Scuba diving. Amenities: Litter bins and cleaning services. Sunbeds and umbrellas for rental. Sail boat hire. Getting there: Turn off N-340 coastal road. Parking available on the beach front – look out for pay and display machines. Where to stay: If you are looking for 4 Star beachfront luxury with a pool check-out Sol los Fenicios or Marina del Este’s Hotel Best Alcazar. Only 5 minutes from the beach is the boutique Hotel La Tartana and for some something a little more modest take a look at these two fantastic guest houses Pensión La Herradura and La Caleta Bay. Where to eat: There are numerous beach front restaurants, chiringuitos and bars to choose from, but if you are looking for something special make a reservation at the long established Hotel La Tartana. The two sheltered bays of Cantarrijan, situated in the Acantilados de Maro-Cerro Gordo Natural Area shared with Málaga Province, are the most western beaches in Almuñécar and the last on our list. The first of the two has a couple of restaurants to choose from and GranadaSpain would definitely recommend La Barraca for a good seafood lunch, great service and a relaxed ambience. The second beach has less to offer in the way of amenities and is more popular with nudists. For more details about this great beach check-out our blog here. Swimming/activities: Calm sheltered waters. Nudist. Amenities: Litter bins and cleaning services. Sunbed and umbrella rental. Sail boat, kayak and pedalo hire. Getting there: Turn off the N-340 for Cantarriján beach just before the Cerro de Gordo tunnel (if you are traveling west). Accessible by car for most of the year on a 1km concreted track through Natural Parkland. In the busy summer months (July and August) you must park up on the N-340 and take a shuttle bus or go on foot. Where to stay: As this beach is slightly off the beaten track the nearest accommodation is to be found in La Herradura where there is a plenty of variety to suit your needs and budget including 4 Star beachfront luxury with a pool at Sol los Fenicios or Marina del Este’s Hotel Best Alcazar, the boutique Hotel La Tartana and for some something a little more low-key Pensión La Herradura and La Caleta Bay two great value guest houses. 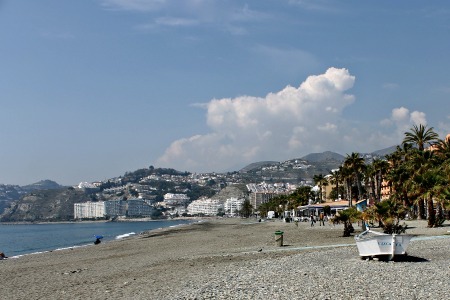 You could also take your accommodation search further west to Nerja in the neighbouring province of Málaga. Where to eat: Right on the beach at La Barraca. Click on the map for quick info and further links. 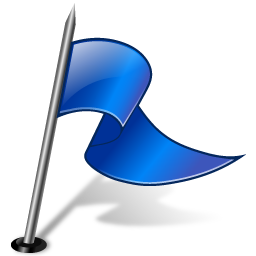 *Blue Flag Bandera Azul – awarded to beaches and marinas that meet stringent standards for water quality, safety, environmental education and information, the provision of services and general environmental management. *** Churros – long, thin deep fried pastry much like doughnut. Best dunked in chocolate or sprinkled with sugar and enjoyed on the beach.